We’d love your help. Let us know what’s wrong with this preview of The Airbnb Story by Leigh Gallagher. This is the inside, behind-the-scenes story of airbnb -- the company reshaping how we travel. Two broke art school graduates set up a platform that – in six short years – became the largest provider of accommodation in the world. Now valued at $25.5 billion, it is in the very top tier of Silicon Valley ‘unicorn’ startups. Yet Airbnb has been controversial – disrupting a $50 This is the inside, behind-the-scenes story of airbnb -- the company reshaping how we travel. Two broke art school graduates set up a platform that – in six short years – became the largest provider of accommodation in the world. Now valued at $25.5 billion, it is in the very top tier of Silicon Valley ‘unicorn’ startups. Yet Airbnb has been controversial – disrupting a $500 billion hotel industry makes you a few enemies – and many regulators and politicians want to shut it down. Hotel owners don’t know whether to copy it or kill it, neighbours of Airbnb rentals complain about transient visitors, hosts report increases of damaged property, and some tech industry analysts think it’s grossly overvalued. Beyond the headlines and the horror stories, Airbnb has changed the terms of travel for a whole generation. People who care more about finding like-minded locals than hotel breakfasts, and which has found a platform to build trust between hosts and guests in a way that hotels have struggled to replicate. To ask other readers questions about The Airbnb Story, please sign up. I love stories about these plucky little start-ups that make it big - it's like a modern-day version of the Horatio Alger myth or the Cinderella fairy tale. In the age of information, everyone's out to create the next big website or app, trying to find that niche that everyone has miraculously ignored and yet desperately needs. AirBnb is one of those businesses that started out in someone's apartment and ended up becoming a booming global enterprise. THE AIRBNB STORY chronicles the company's origins, its growth, its struggles, its successes, and its potential for growth. I didn't actually know what AirBnb was, until I watched Adam Conover's "Adam Ruins Everything" video about AirBnb (and much of what he says can be found in the chapter on AirBnb's struggles). We've all heard the horror stories about tenants from hell, but we've also seen the BuzzFeed listicles about the most fantastic listings on the site, many of which are crazy affordable, and amazing hosts who end up forming not just a customer-client relationship but a personal one. AirBnb is, at heart, like most other large companies: it has positives and negatives, but it found a niche that hadn't really been deeply explored. They went exploring, and ended up creating a multi-billion-dollar company because of it. The book itself is a little slow to start, with a lengthy prologue, but quickly picks up in pacing. I liked that the author was actually able to sit down with the founders and ask them questions. She had a good narrative "voice" and did a good job explaining how AirBnb entered the pop culture lexicon. If you are interested in start-ups or the corporate culture of tech companies, you will like this book. Nothing new. Absolutely insincere. IPO advertising book. Short version of book: AirBNB is friendly and disruptive, hotel lobby is eval, founders are genius, everybody loves Airbnb, nothing bad should happen. I don't hate the company, no bad feelings about it. But the book has nothing intereating. Having just stayed at a Airbnb and running a Airbnb home, I was very curious how the American business model got started. Interesting book mixed with some dry statistics. Obviously a lot of research went it to it! The three men who started it, Joe Gebbia, Nathan Blecharczyk and Brian Chesky, have changed the travel and hotel business forever. A wonderful story about three guys who just blew up the tourism industry with their start-up Airbnb. They had a very difficult path, but their passion for their work was stronger. Now it is a multi-billion dollar business. An interesting story about one of the most successful "unicorns" of Silicon Valley. Замечательная история о трех парнях, которые просто взорвали туристическую индустрию своим стартапом Airbnb. У них был путь очень сложным, но их страсть к своему делу была сил A wonderful story about three guys who just blew up the tourism industry with their start-up Airbnb. They had a very difficult path, but their passion for their work was stronger. Now it is a multi-billion dollar business. An interesting story about one of the most successful "unicorns" of Silicon Valley. Замечательная история о трех парнях, которые просто взорвали туристическую индустрию своим стартапом Airbnb. У них был путь очень сложным, но их страсть к своему делу была сильнее. Сейчас это многомиллиардный бизнесс. Интересная история про одного из самых успешных "единорогов" Силиконовой долины. There's an incredible amount of research gone into this book with plenty of data, statistics, quotes, details of local laws, etc. Personally I found it all made for a dull story wtih too much minutia. I enjoyed the chapters about people's personal experience of renting out their homes but most were dramatically bad so it made me wonder why people do it. There was a lot of detail about the company's conflict in big cities like New York where renting out your home, or part if it, seems to be in co There's an incredible amount of research gone into this book with plenty of data, statistics, quotes, details of local laws, etc. Personally I found it all made for a dull story wtih too much minutia. I enjoyed the chapters about people's personal experience of renting out their homes but most were dramatically bad so it made me wonder why people do it. There was a lot of detail about the company's conflict in big cities like New York where renting out your home, or part if it, seems to be in conflict with many local laws. I found all the legal stuff very tedious, not helped by the fact I am not a US citizen so the many different laws and regulations meant nothing, nor the politians and local people in government that were quoted. It took me weeks to read and even then I have skimmed much of it. What an interesting and inspiring story. Definitely have to recommend this to a few friends. The story started from a room where two design school graduates, Brian Chesky and Joe Gebbia, lived. They pursue an idea to connect room and house owners to random travelers or ordinary people. The idea sounds weird and crazy, but nowadays the startup has a US$31 billion valuation. However, it's not an easy way to crossed for Airbnb's founders. They have to asked their mate Nathan Blecharczyk to leave his fiancee and join them through Y Combinator, they had to sell a gigantic amount of cereal to stay alive, and they also had to face a big wall of regulation that was created by government. Airbnb's key of success is laid inside their founders' mind. Chesky is a natural leader and learning enthusiast, while Gebbia is a perfectionist that can handle the company's operation and new innovations really well. Blecharczyk, is not only an ordinary CTO. He has a great business mind that inspired him to create growth hacking tools, such as integration to Craiglist and legendary payment system. Fascinating story of how Airbnb began incidentally by two art majors and a computer person and grew so fast. The company was brought to my attention by a daughter several years ago and now in 2017, I will soon stay at one of these online booked BnBs. This perhaps repeats their corporate beliefs more often than I would like to hear them, but a corporate entity with beliefs seems unusual in today's crass commercial world. What is fascinating is how each potential setback was dealt with to improve Fascinating story of how Airbnb began incidentally by two art majors and a computer person and grew so fast. The company was brought to my attention by a daughter several years ago and now in 2017, I will soon stay at one of these online booked BnBs. This perhaps repeats their corporate beliefs more often than I would like to hear them, but a corporate entity with beliefs seems unusual in today's crass commercial world. "The Airbnb Story" pretende contar a fascinante história de como uma ideia simples se tornou num enorme fenómeno mundial. Toda a gente sabe o que é o Airbnb e toda a gente já teve alguma experiência, directa ou indirecta, com a plataforma. E foi por isso que decidi ler este livro e saber mais sobre o seu passado. A jornalista Leigh Gallagher mostrou ser uma excelente narradora, tentando mostrar tanto as falhas como os sucessos da plataforma e dos seus fundadores. Para além disso, Gallagher explora o possível futuro da indústria de viagens, uma abordagem que enriquece bastante o livro. Recomendo este livro quer para os que querem saber mais sobre a história do Airbnb como entrepreneurs e interessados em start-ups. "The Airbnb Story" serve como uma ferramenta interessante de motivação e informação! "The Airbnb Story" aims to tell the fascinating story of how a simple idea became a massive global phenomenon. Nowadays, everyone knows what Airbnb is and everyone has had direct or indirect contact with it. And that is why I decided to read this book and get to know about its past. Journalist Leigh Gallagher is an excellent narrator, trying to explore the failures and successes of the platform and its founders. Moreover, Gallagher explores the possible future of the travel industry, an approach that enriches the book. I recommend this book to those who want to know more about the origins of Airbnb and entrepreneurs and start-up enthusiasts. "The Airbnb Story" is an interesting tool for motivation and information! Не дочитав! Книга дуже банальна. Краплинка цікавої інформації і відро води. Написано для тих хто любить читати заради читання. Struggled to hold my attention after that. Last year at this time , we were living in Nicholas's flat. A living room full of books, with Victor Hugo in French. Pencil sketches of cats and horses on the walls. A kitchen and dining room with a polished mahogany table. Even our hard- to- please three teenage daughters were totally charmed. And this sprawling apartment , next to the Jardin Trocadero, for much less than the price of two Parisian hotel rooms . Such is the power of the famous 6 letter word in today's holiday and hospitality wor Last year at this time , we were living in Nicholas's flat. A living room full of books, with Victor Hugo in French. Pencil sketches of cats and horses on the walls. A kitchen and dining room with a polished mahogany table. Even our hard- to- please three teenage daughters were totally charmed. And this sprawling apartment , next to the Jardin Trocadero, for much less than the price of two Parisian hotel rooms . Such is the power of the famous 6 letter word in today's holiday and hospitality world - Airbnb. If you, like me, and a million other people world wide, have stayed in an Airbnb apartment , you'd probably want to know how it all began. Leigh Gallagher's book is a good place to start. Like most people, I’d heard the story of how Brian Chesky and Joe Gebbia began renting out their living-room airbed, to make money for rent. But the details of how this happened and how this venture grew and grew is a Silicon Valley fairy tale I didn’t fully know. Like all fairy tales, this one bears retelling, something Leigh Gallagher, assistant editor at Fortune magazine, does engagingly in this well-researched book. Would-be entrepreneurs can take heart from all the struggle (eating dry leftover cereal for every meal) and the scorn from investors (the idea of renting out space to strangers was considered weird and unbelievably risky) chronicled in this book. Airbnb went through many iterations, from being a company that insisted hosts supply only airbeds and be there to offer breakfast, to its present-day avatar. It failed many times, launching and relaunching in different cities, trying to capitalize on the extra demand for hotel rooms during conventions. Then there were the lucky breaks, most of which came from dogged persistence, like becoming part of the Y Combinator accelerator, a mentoring programme for start-ups. This gave the young start-up credibility, funding from private equity firm Sequoia, and mentorship. Gallagher tells this story fluently. The first few chapters are eventful and racy, and then the book settles down to a comfortable mix of events and analysis. 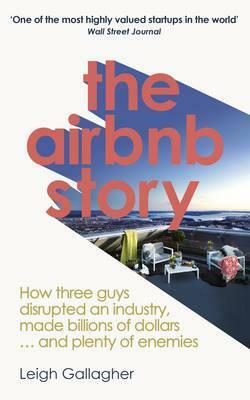 Chief executive Chesky is the public face of Airbnb, so it’s understandable that much of the book focuses on him. The other two founders, Gebbia and Blecharczyk, get a chapter each, but team Airbnb never comes to life. If the book has a flaw, it’s this. Gossipy titbits, like Chesky’s relationship with Indian-American girlfriend Elissa Patel, are conspicuously missing. Gallagher focuses only on the business of Airbnb. “Airbnb tapped into something greater than low prices and an abundance of available inventory. It offered an experience that was special and different. Even its imperfections fed into a growing desire for a travel experience that felt a little smaller-scale and more ‘artisanal’ than staying at a standard hotel,” she writes. “It also opened up access to different kinds of neighbourhoods than traditional tourist zones, so you could have an experience that felt more local. These elements were particularly powerful for millennials, who have exhibited a growing dissatisfaction with big brands and a greater sense of adventure, and those who grew up so accustomed to digital-only interactions that venturing into the home of someone they’d connected with online wasn’t much of a stretch,” she tells us. The explosive popularity of Airbnb has inevitably brought it into conflict with its biggest competitor—the hotel industry. Hoteliers complain that Airbnb has an unfair competitive advantage—it is not subject to the regulations and taxes that the holiday industry is. Hotel industry lobbyists have enlisted the help of the law effectively in cities like San Francisco and New York.The story of this upstart digital industry battling with its traditional model is fascinating for anyone following the disruptive nature of today’s world. And Gallagher tells it well. Even though she is obviously partial to the magic of the Airbnb proposition (as is this writer!). She also tackles the crises in Airbnb, including the much reported ransacking of hosts’ houses and the media outrage over them. Great reading for anyone who has ever stayed in an Airbnb or is considering staying in one, for all entrepreneurs everywhere, and for anybody interested in seeing up close what “disruption” is really all about. Many people have heard the story about Brian Chesky and those rented out air mattresses that lead to a company now worth 30 Billion dollars, but most people don't know how millennials changed the hotel industry. *My husband and I were trying to find a hotel in Munich. I had the filter set wrong so it was searching during Oktoberfest and prices were outrageous. *I started searching on something called Airbnb because my grown kids had told me about it. *I daydr Many people have heard the story about Brian Chesky and those rented out air mattresses that lead to a company now worth 30 Billion dollars, but most people don't know how millennials changed the hotel industry. *I daydreamed about a beautiful apartment in Munich where we would have a more authentic experience. *I thought to myself, if I'm looking for something like this on the other side of the world, maybe there are people on the other side of the world looking for this in Denver. *I drank wine on the deck and told my husband we should become Airbnb hosts. I was just being silly. *I began to research it. *I emailed a host 1/2 mile from us and asked her if I could treat her to lunch in exchange for information. She told me she rented out a room to help pay for her children's college tuition. She surprised me by saying most of her guests were young women who didn't like to stay in hotels. *My husband and I stayed in an Airbnb bedroom at the apartment of a young couple in Breckenridge, CO. It was cheap, comfortable, but most of all, an adventure. *I listed my house on Airbnb because of the site's friendly interface. It took less than 15 minutes. *I had my first booking in less than 24 hours. The female guest showed up at 8 p.m., heated up some soup, went to bed, and left by 6 a.m. She didn't even want a shower or a cup of coffee. *My grown kids lectured me and said millennials don't want to meet you. They just want a bed. *My husband and I hosted people during the summer of 2016, mostly Red Rocks concert attendees. *We put our site on hold for the winter but just re-listed it for the summer concert season. After listening to this book it helped me understand what I couldn't put into word: Airbnb is about a unique experience, one that hotels can't give you. Airbnb offers you a human experience that is intimate, something tech savvy youngsters are craving. Now it's not just for the young people---people of all ages are trying Airbnb. Interesting book about how Airbnb got started. The author also delves into the reasons the company is successful as well as a broad discussion of the evolving travel industry. Recommended reading! Leigh does a fantastic job of telling the story of the sheer innovation and resilience Joe Gebbia, Brian Chesky and Nathan Blecharczyk had when airbnb was in seed form. She doesn't tell this story as a fairytale with a happy ending. She goes the extra mile by fishing out details otherwise not known and expressing struggles that are either relatable or hard to fathom. One key lesson that stood out for me was that a broad vision does not come in one sitting. Iterations are required to capture and br ​Leigh does a fantastic job of telling the story of the sheer innovation and resilience Joe Gebbia, Brian Chesky and Nathan Blecharczyk had when airbnb was in seed form. One key lesson that stood out for me was that a broad vision does not come in one sitting. Iterations are required to capture and bring visions to reality. A very well-told account of the Airbnb story. It's more personal than what's discussed in Upstarts. There's a portion in the middle related to the regulation that's a bit dry (but necessary, I suppose, given all of Airbnb's controversy there). Excellent book on creative disruption from start-up giant Airbnb. Well worth the read! 4/5: I think that nine years is still a relatively small amount of time to be put into a book. The book does have plenty of exciting details, but I felt that about half of it is more about "hotels vs. home-sharing" discussion than about the Airbnb as a company itself. I mean, the book is cool, but I feel that it will be much more to the story in 5-10 years. Worth reading though. Leigh Gallagher tells the sweat-driven story of the founders of the billion dollar company, Airbnb. Themes taken away from the novel are: never giving up, always refining, and always be the hardest working man in the room. Gallagher uses Pathos to appeal to the emotions of the reader throughout the novel. The Airbnb story is truly inspiring, as we learn of the founders struggle to succeed. Brian Chesky, Joe Gebbia, and Nathan Blecharczyk show that no matter how significant the odds against them Leigh Gallagher tells the sweat-driven story of the founders of the billion dollar company, Airbnb. Themes taken away from the novel are: never giving up, always refining, and always be the hardest working man in the room. Gallagher uses Pathos to appeal to the emotions of the reader throughout the novel. The Airbnb story is truly inspiring, as we learn of the founders struggle to succeed. Brian Chesky, Joe Gebbia, and Nathan Blecharczyk show that no matter how significant the odds against them are, they will not stop until they succeed. The Airbnb story, begins with 2 Rhode Island School of Design graduates, Gebbia and Chesky. Gebbia and Chesky were living in a San Francisco and needed to think of a way to make money to pay their rent. They had this brilliant idea to rent out air mattresses in their apartment while a major design festivity was in town. With their newly sparked interest to turn this idea into a business they needed someone to design, refine, and establish the more technical aspects of this future business. Blecharczyk, a self taught coder with a computer science degree from Harvard had been Gebbia's roommate at one point. They wouldn't be able to do it without him. They focused on creating a website that targeted sold out conferences, selling space for people to stay. They had the vision to launch Airbedandbreakfast.com at a technology gathering in Austin, TX. At the convention Chesky met Michael Seibel. Seibel is described in the story as, "The Godfounder". In my opinion it’s a miracle this happened because without his knowledge and connections I don’t believe the company would have stayed in business. After refining and refining they came up with the idea of the same version of Airbnb that exists today. I was not aware of Airbnb until I read this book. After meeting with seven angel investors, the author describes their company as, "radioactive". I was kind of shocked that not even one person wanted to take a risk on the company. They launched their site for the third time on August 11, 2008 before the Democratic National Convention in Denver. The main issue from this launching was that no one wanted to list their home if no one was going to book it. They pitched their ideas to small blogs which turned into a snowball effect: The Denver Post, the New York Daily News, and the New York times featured stories. I can’t imagine how many people would have viewed their story today with social media. With this exposure, over eight hundred people listed their rooms, and eighty guests booked. PayPal froze their payment account after the spike in activity. As soon as the convention was over, they were back to square one. Their traffic had crashed. Yet, once again, I admire their perseverance to not give up. Desperate, out of money, and in debt, they resorted back to an idea where they would ship their hosts free breakfast, who could then give that to their guests. They decided on cereal and created Obama O’s and Cap’n McCain’s. In my opinion, it was very clever to keep the menu very simple not to complicate their situation worse. They had amassed a huge debt of over $20,000. With their backs against the wall once again, they decided to pitch the boxes as a collector’s item, selling them for forty dollars each. And we all know more often than not, when you market something as a one time exclusive, it will sell. The cereal was a massive success. They were able to pay off their debt. Once again they were back at square one, with no money and out of food. One night at dinner, Seibel suggested that they apply to Y Combinator. Chesky felt insulted by this suggestion, as Y Combinator was for prelaunch companies. Paul Graham founded Y Combinator, and it is known as the most powerful startup supply for seed funding. Seibel suggested that this was their last chance to stay afloat. Once again Seibel is saving the day. They applied, got an interview, and convinced Blecharczyk to come back to San Francisco for it. After preparing for hours for their interview, Gebbia grabbed their boxes of cereal and headed to the car. Chesky and Blecharczyk did not agree with this and told him to leave the cereal at home. I can understand their frustration, the cereal seemed very unnecessary in the moment. The interview did not go well, as Graham questioned what was wrong with people, and why are they actually doing this. In my opinion Graham seems like a very intimidating man. Before they were about to leave, Gebbia pulled the cereal boxes out, and told Graham the story behind them. Graham replied, “You guys are like cockroaches. You just won’t die.” I personally think this quote really embraces the mindsets of the three co-founders. Leigh Gallagher in The Airbnb Story: How Three Ordinary Guys Disrupted an Industry, Made Billions . . . and Created Plenty of Controversy takes you on a rollercoaster journey which is unconventional, funny and inspiring. My favourite aspect was that she doesn't paint it as a perfect fairytale. Instead, she goes the extra mile by fishing out details otherwise not known and expressing struggles that are either relatable or hard to fathom. A very inspiring and well researched account of Airbnb's creation and growth. Books notes (at back of the book) include links to some very interesting articles for those interested in delving deeper. Success stories are always appealing. What we now know as Airbnb started in 2004 with Brian Chesky and Joe Gebbia, two broke industrial and graphic design school graduates. Later their befriended programmer Nathan Blecharczyk joined. The three worked out an idea to rent out air beds and breakfast to make some money. This was the conception of what became Airbnb, now valued at $30 billion and on the eve of entering China. The boys had the luck of a perfect timing to meet investors. The unique sell Success stories are always appealing. What we now know as Airbnb started in 2004 with Brian Chesky and Joe Gebbia, two broke industrial and graphic design school graduates. Later their befriended programmer Nathan Blecharczyk joined. The three worked out an idea to rent out air beds and breakfast to make some money. This was the conception of what became Airbnb, now valued at $30 billion and on the eve of entering China. The boys had the luck of a perfect timing to meet investors. The unique selling points of their business model, two markets where demand and supply are facing each other, a powerful payment system, starting as the Craigslist for rooms, but quickly becoming a disruptive force in hospitality services without owning any of the homes or rooms that are rented out. Leigh Gallagher tells The Airbnb Story in chronological order, and shares from an abundance of background information, memoirs, and interviews. Not only Airbnb is covered, also its main competitors (e.g. Away.com, VRBO.com, couchsurfing.com) and the differences in market approach, products and services offered and the outlook for the near future. Will the traditional hotel chains ultimately take over? Can market entrants or competitors somehow steal and copy the business model? And can Airbnb itself evolve into a successful multiproduct firm with spread risks to survive in the long run? It is not so long ago that a couple of friends sowed the seeds for what would become a major disruptive element and force within the global accommodations industry – Airbnb. Less than one decade later this start-up has won a lot of friends and plaudits, whilst attracting a fair-few enemies and detractors too. This is a fascinating look at a company that has, like it or not, changed travel for a large section of the travelling public. Even if Airbnb was no more, it is unlikely that the genie could It is not so long ago that a couple of friends sowed the seeds for what would become a major disruptive element and force within the global accommodations industry – Airbnb. Less than one decade later this start-up has won a lot of friends and plaudits, whilst attracting a fair-few enemies and detractors too. This is a fascinating look at a company that has, like it or not, changed travel for a large section of the travelling public. Even if Airbnb was no more, it is unlikely that the genie could go back in the bottle and the “old norms” return. A lot is crammed into a relatively compact, informative book. The author has done a good job in remaining objective and focussed, it did not read like a hagiography and the writing style was engaging and accessible. Even if you have no intention in becoming an Airbnb customer (or supplier), reading this book will still give a lot of great information about business development, start-ups, culture and more. A great lightweight read, with a heavy, quality overlay. "Pessimists are usually right, but it's the optimists who change the world". This book provided a super in-depth story about how the founders of Airbnb unexpectedly came upon the idea and utilized their little to none business experience to scale the company at an unprecedented rate. It doesn't just go into the founders' stories, but also the nuances of the Airbnb community and its impact on society. Leigh goes into extreme detail about the diehard hosts who live by the platform, the legal battl "Pessimists are usually right, but it's the optimists who change the world". Great story, but such a young company so there is so little to tell. This would be a groundbreaking book in another 5-10 years. The author clearly loves Airbnb and probably cringed at the idea of saying anything critical about them. You learn about how they hustled to take off with clever PR strategies, risky market entry and desperate fund raising. If you are a fan of Airbnb, you'll enjoy the read as I did. This book is more or less propaganda, but I've been drinking the Kool-Aid for a while now, so I found it interesting. Airbnb sent us a copy of the book for being superhosts. I learned a few things I didn't know about the early days of the startup, but most of the info was expected. I love Airbnb. It has been great for me as a traveler and a host. It has its challenges, but I hope the platform continues to grow and do well. This is an incredibly interesting narrative outline of the stand-up of Airbnb and as important the leadership maturation of its funding and business. Of particular value to the reader is the Airbnb vision that shapes the company direction and rationale in legal challenges. I found the "What's next chapter" (chapter 8) and City Host venture fascinating. In a way, I felt that the author bought in a little too much to the Airbnb vision to probe deeper into its appeal as a disruptive innovation. Leigh Gallagher is an assistant managing editor at Fortune and cochair of the Fortune Most Powerful Women Summit. She is a frequent guest on MSNBC's Morning Joe and public radio's Marketplace; appears frequently on CNN, CNBC, and other outlets; and speaks regularly on business and economic issues. The End of the Suburbs is her first book. (Biographical blurb from the back of The End of the Suburbs. Leigh Gallagher is an assistant managing editor at Fortune and cochair of the Fortune Most Powerful Women Summit. She is a frequent guest on MSNBC's Morning Joe and public radio's Marketplace; appears frequently on CNN, CNBC, and other outlets; and speaks regularly on business and economic issues. The End of the Suburbs is her first book.